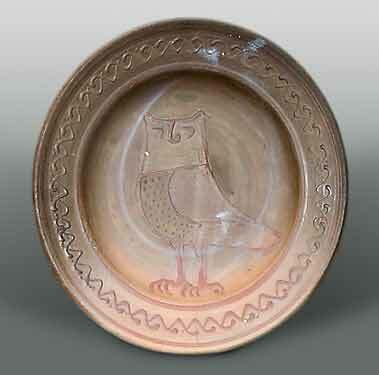 Bernard Leach owl plate - 20" (508 mm) diameter. 1936. Bernard, for one reason or another, didn't finish this, It is unglazed. 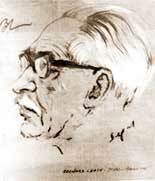 Bernard Leach is, without a doubt, the best known and most prominent of British studio potters. His friendship with Shoji Hamada and his shuttling between Japan and St Ives are well documented. Born in Hong Kong, he was taken almost immediately to Japan by his grandparents. He came to England at the age of ten for schooling. After a brief spell working as a clerk for the Hong Kong and Shanghai bank he attended The London School of Art. In 1909 he returned to Japan to teach etching which he had himself learnt from Frank Brangwyn, and while there married for the first time. After ten years of life in the East - both Japan and China - he met Hamada. The following year they both came to England and set up the Leach Pottery at St Ives. The years between the wars were hard for Leach; he spent much time re-building kilns, experimenting with materials, travelling - but not achieving much critical or financial success. It was not until after the Second World War, and the publication of his first book, A Potters' Book, that he became widely recognized as a master in his field. He continued to pot until 1972, but did not stop his ceaseless travelling. The Victoria and Albert Museum in London held an exhibition - The Art of Bernard Leach - in 1977, and in 1979 he died.